Claudio Bravo’s move from Barcelona to Manchester City is closer than ever. Mundo Deportivo reports that the 33-year-old goalkeeper has emptied his locker at Barca’s Ciutat Esportiva, a signal that he is on the move. 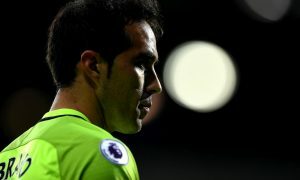 Bravo’s teammates have noticed his empty locker, the report states, and the humble Chilean ‘made no fuss’ about it, saying nothing as he prepares for a new adventure in the Premier League. The Chilean might already be a City player had Barcelona been able to acquire a replacement sooner, but with Marc-André ter Stegen still injured, Bravo has continued to start for the Spanish champions. He will man the goal today against Real Betis in what will almost certainly be his final appearance at Camp Nou. The big news out of Spain today is that Barcelona have a total agreement with Ajax to sign Jasper Cillessen, meaning there is nothing blocking Bravo’s move to City after the conclusion of their match this afternoon. Pep Guardiola will be relieved to have Bravo signed up, having been unconvinced by Joe Hart’s footwork. Current starting goalkeeper, Willy Caballero, again looked shaky when distributing the ball today and it is clear that City’s new style of football requires a goalkeeper who can pass the ball well. In 32 La Liga appearances last season, Bravo had an 84.3% pass accuracy, even higher than Manuel Neuer who played for Guardiola’s Bayern Munich team. Beyond his passing ability, Bravo is also a very athletic shot-stopper capable of some fantastic saves, and will soon be between the sticks for Manchester City.